Richard Irwin (Belper, United Kingdom) on 18 April 2008 in Plant & Nature. The tulip season is just starting over here, so they will feature in some forthcoming shots I take no doubt. Here are some bright red ones to start the season off. Beautiful tulip bulb you have here. Lovely shot,vivid colours.I do like the theme repitition in the background!! Love the wonderful color! Beautiful shot. Lively, vibrant colors. 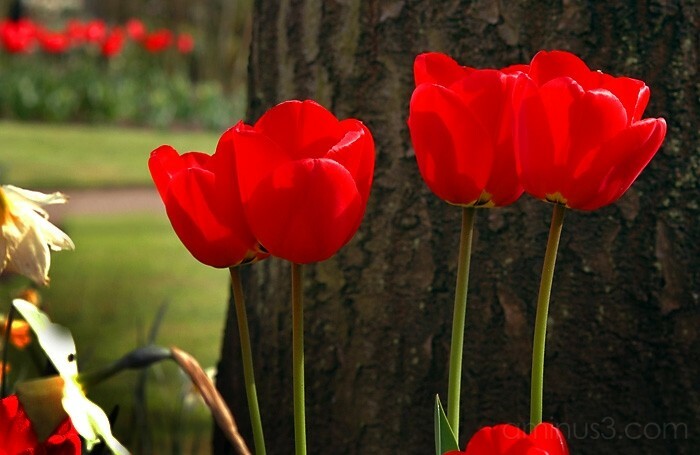 Thanks for sending tulips to all of us around the world. Wonderful red tulips Richard, they look great against the bark of the tree and in the background. I had to lift our tulips as we were having the drive block paved, they are quite resilliant flowers, I put them all in one big pot and the buds are starting to open. I'm really pleased we haven't lost them. A nice vivid display, looks great. what a stunning red! And of course a great pic with a good focus! its Tulip Time here too, but the weather is wee bit odd. Snow is in the forecast for tomorrow. How wonderful. Tulips are so beautiful. I love the intensity of the colours!